Tag line: "Past and present collide in a vortex of fear!" The House by the Cemetery closes out Lucio Fulci’s Gates of Hell trilogy, and while it’s not as strong as either City of the Living Dead or The Beyond, it does capture the foreboding atmosphere of those movies, while also giving us plenty of that "Fulci gore" to keep our stomachs churning. Professor Norman Boyle (Paolo Malco) is moving his family to New England, where he’ll continue the research started by a colleague of his, who inexplicably went mad, killing his mistress before taking his own life. In fact, Dr. Boyle, along with his wife Lucy (Katherine MacColl) and son Bob (Giovanni Frezza), is moving into the very house where the murder / suicide took place! This might not bother the adult members of the Boyle family, but Bob has been having visions of a young girl (Silvia Collatina), who warns him to steer clear of the place. Once the family settles in, a woman named Ann (Ania Pieronin) suddenly turns up, claiming she was hired by the real estate agent, Mrs. Gittelson (Dagmar Lassander) to look after Bob. As if this wasn’t strange enough, Lucy also finds a headstone hidden under the carpet in the front room, which marks the grave of a Dr. Freudstien. As a result of this discovery, Norman heads down into the basement to check things out, and in so doing awakens an evil force that threatens not only his life, but his family’s as well. 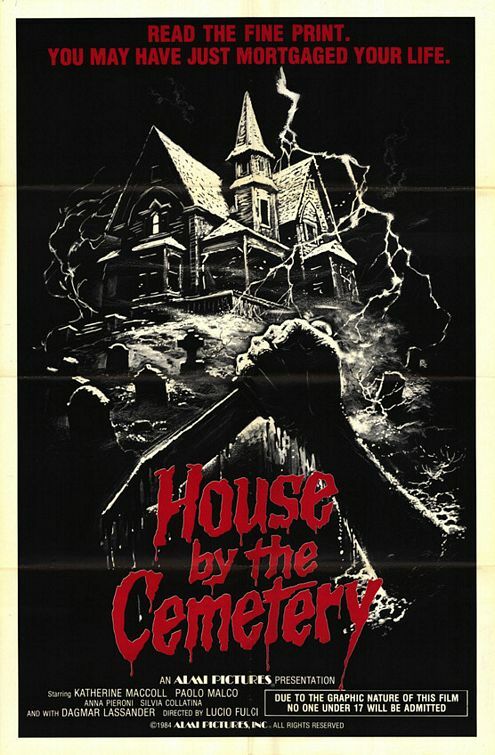 A more appropriate title for this film would have been "The House In the Cemetery", because the headstones from the nearby graveyard surround the entire area, with some only a few feet from the house’s front porch. This alone adds a level of creepiness that works in the movie’s favor. The House by the Cemetery also has a great pre-title sequence, where a teenage girl (Daniela Doria), sitting in the front room of the abandoned house, calls out to her boyfriend, Steve (Ranieri Ferrara), who doesn’t answer her. While searching for him, she comes across his bloodied corpse hanging from a door. The girl screams, but is quickly silenced by a knife to the back of the head, which penetrates all the way through to her mouth. As opening scenes go, this one is pretty grisly. Fulci even adds some mystery to the film in the form of the young girl, named Mae, who warns Bob not to go near the house. Clearly, there’s more to this little girl than meets the eye, and Fulci takes his time in revealing her story. Where The House by the Cemetery falters is in its structure, which has never been one of Fulci’s strong points to begin with. As awesome as the opening sequence is, it doesn’t really fit in with the rest of the movie, and a later scene involving storefront mannequins is way, way out there, as is Fulci’s attempt to tie it in with everything else (in fact, it’s almost laughable). Even the babysitter, Ann, seems more like an afterthought than an integral part of the movie. 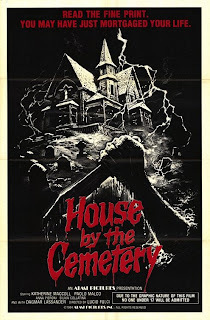 This aside, though, The House by the Cemetery is definitely an eerie film, and an entertaining final chapter to Fulci’s Gates of Hell trilogy.